3.6 out of 5 based on 74 bloggers and 9 commenters. 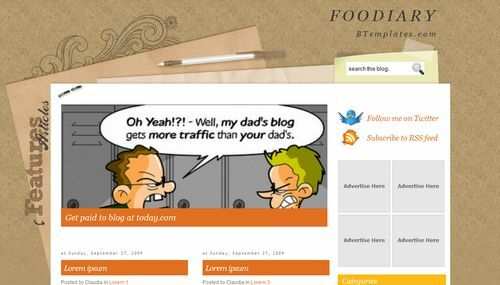 Footo write a diary is a free blogger template adapted from WordPress with 3 columns, magazine-styled, right sidebar, gallery-styled, ads ready, slider, social bookmarking icons and posts thumbnails. FINALLY! One that doesn’t impose all kinds of crazy crap that you have to wade through crappy code to change! THANK YOU!!!! 1) how to change/ remove that ‘READ MORE’ buttonin pink ? 2) how to change the colour of text in the sidebar ? how to get and apply the code in slidshow tag ? He subido este template, pero no consigo que se vea el slide… podría alguien por favor ayudarme.. I uploaded this template, but I can’t get tho show the slide..